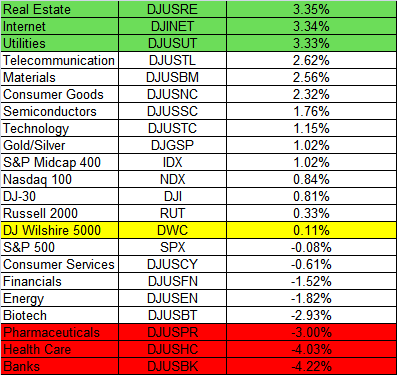 The Dow Jones Wilshire 5000 index, as an average or a benchmark of the total equity market, continued the rally that has been led by the internet and basic materials sectors since September 1. 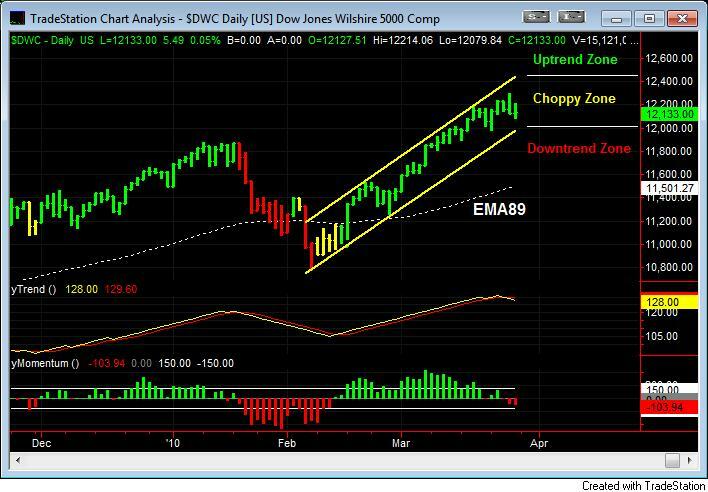 Last week the market got further boosted after the midterm elections and the Fed’s QE2 decision. 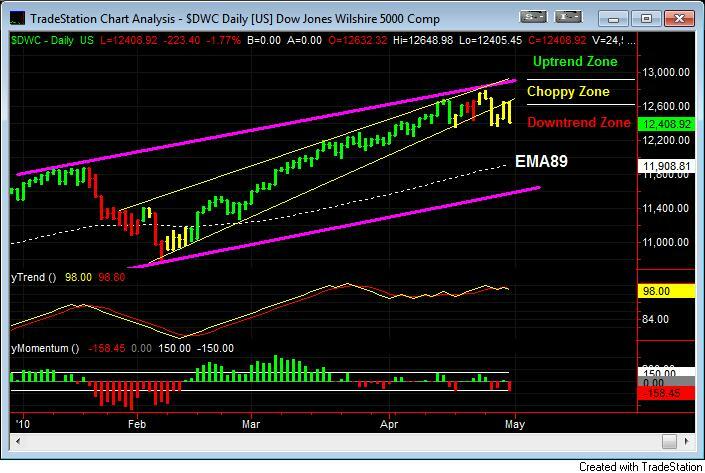 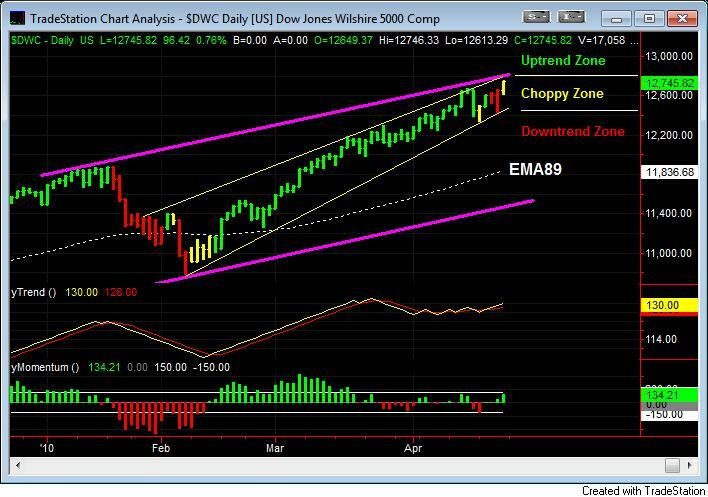 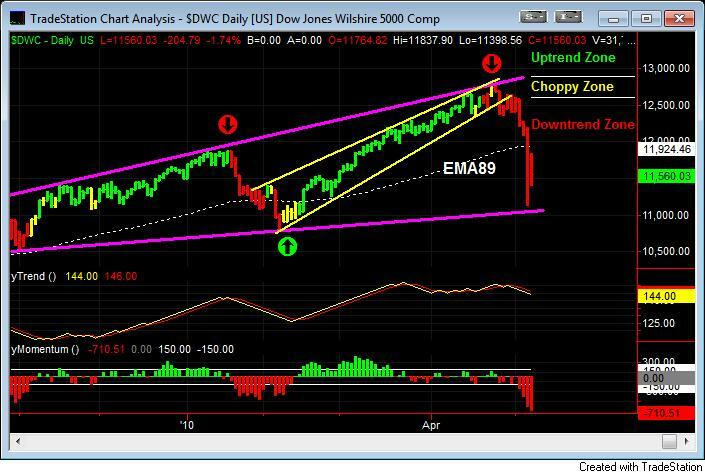 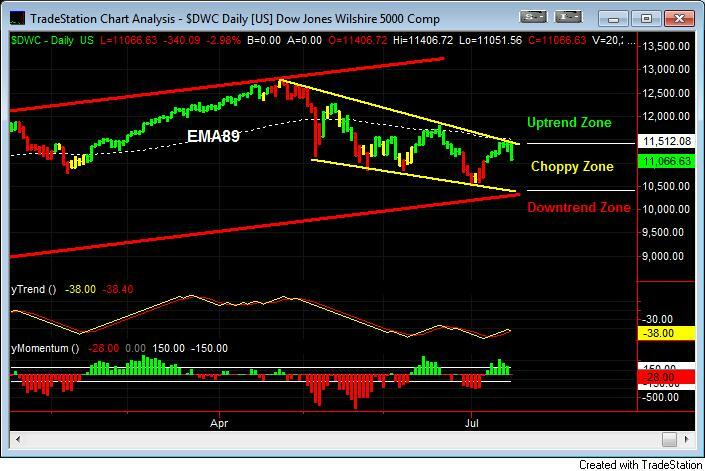 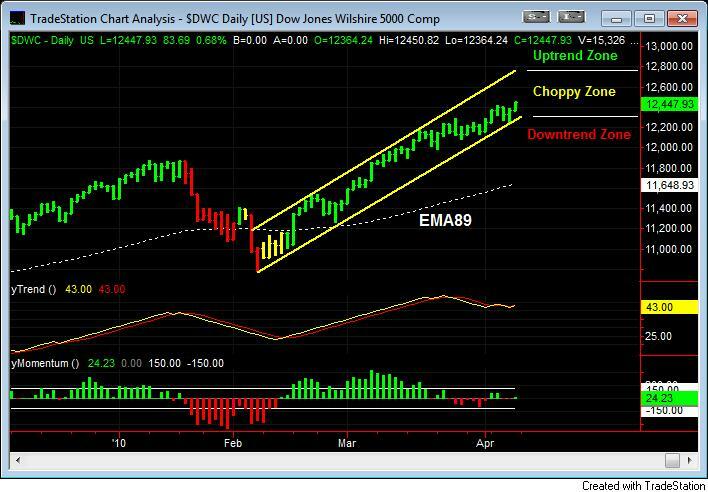 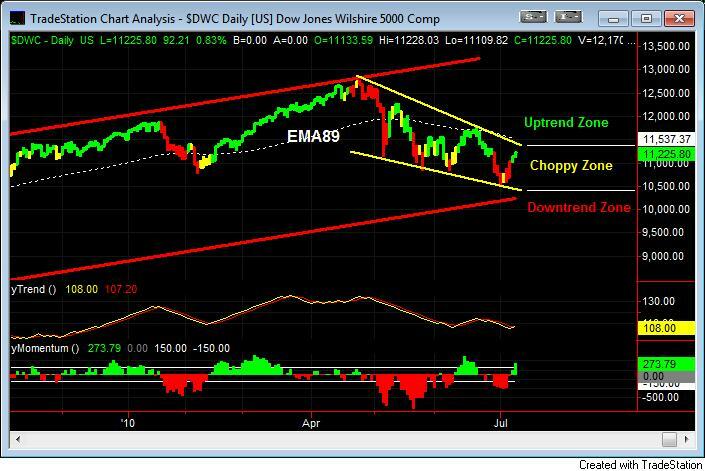 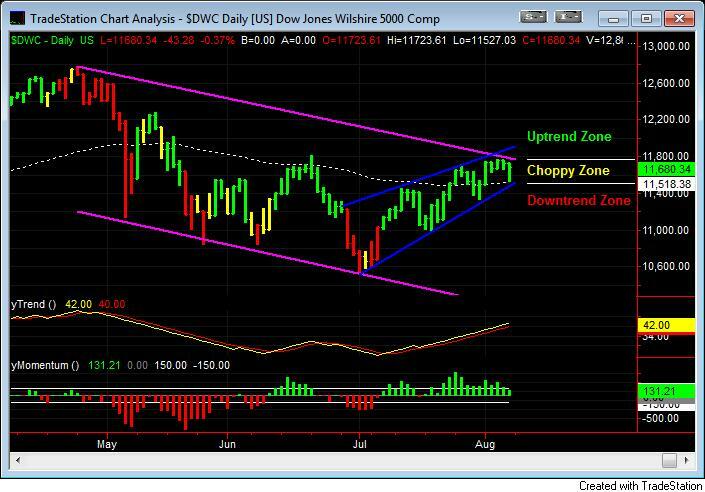 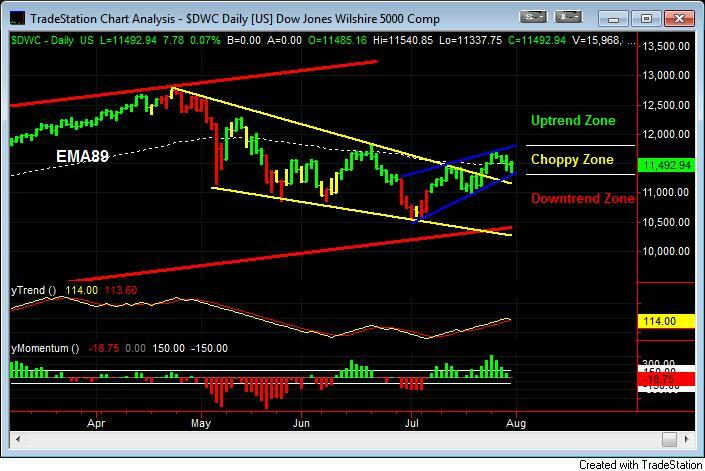 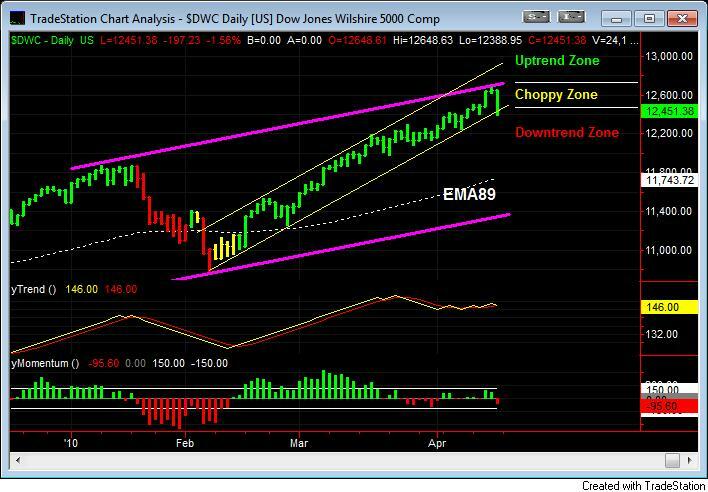 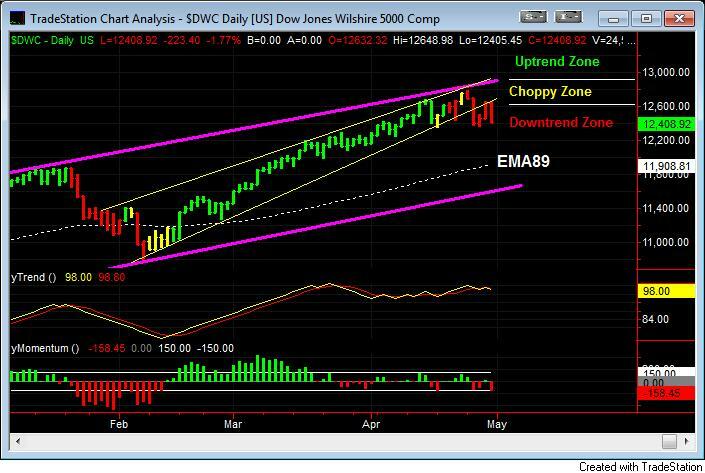 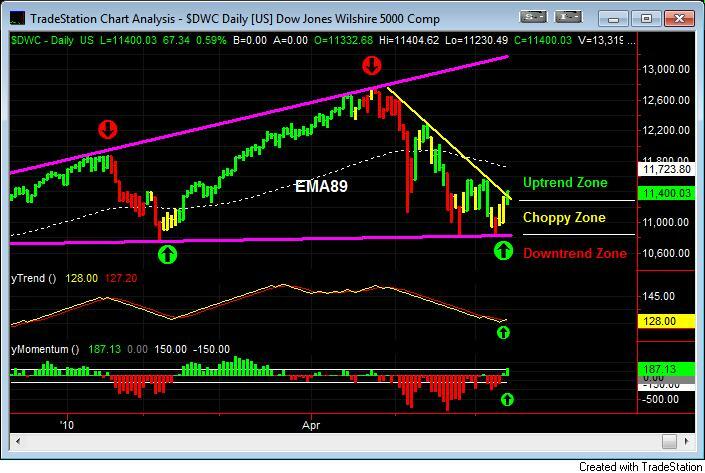 The Wilshire 5000 index reaches the upper boundary of the nine-week uptrend channel with positive values of both the trend and momentum indicators. 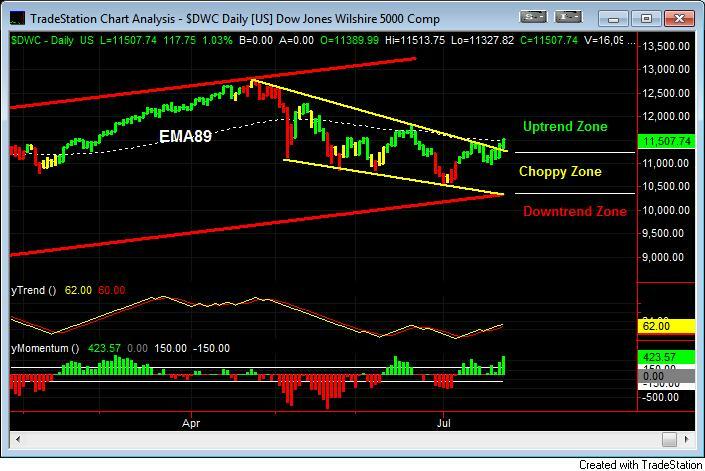 Right now the index is close to the price target of 13000 projected by the measured move based on the Inverted Roof pattern. 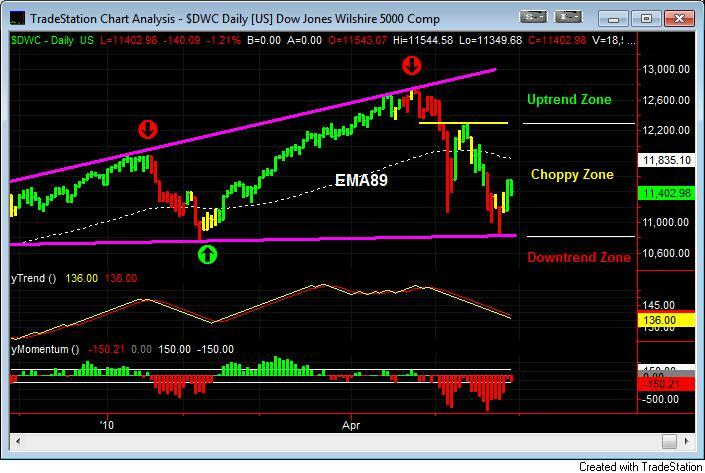 While the measured move of the inverted roof pattern is near the end, the Leading Wave Index (LWX) indicator, color coded in the price bars of the following daily chart of the Wilshire 5000 index, turned off the bullish time-window with a registered negative value (-1.5, red) on Thursday, November 4. 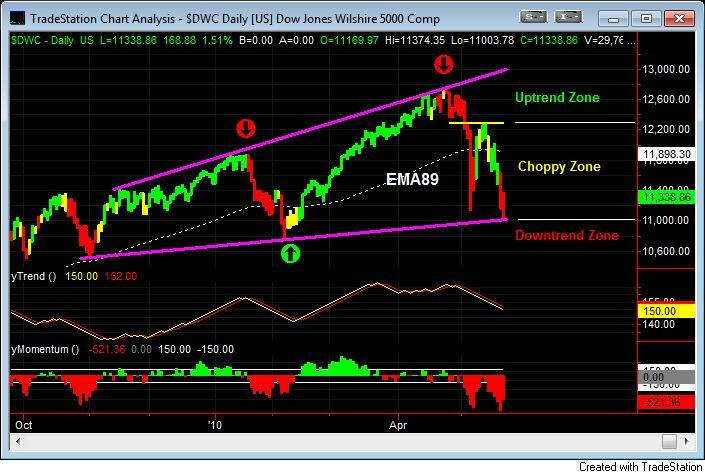 Based on the forecast of the LWX indicator, the market could be entering the bearish time-window which looks similar to what it acted in the topping process in the late of April of this year (see the white circles marked on the chart; click the chart to display a larger image). 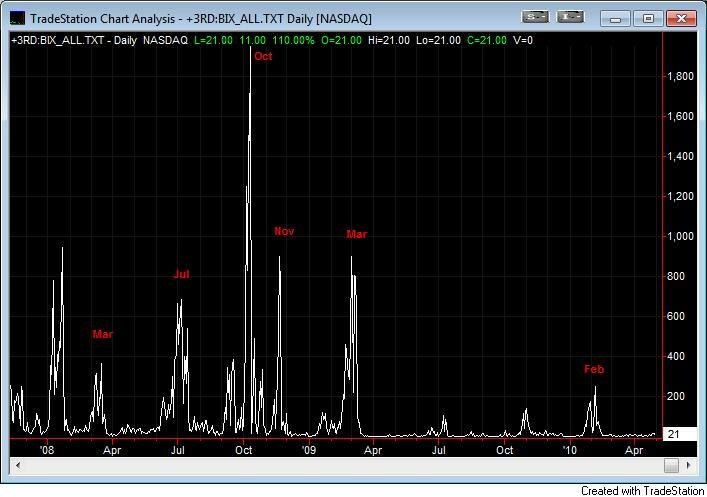 The Broad Market Volatility (BIX), measured from over 8000 U.S. stocks, closed at 5 on Friday and it is below the panic threshold level of 46. 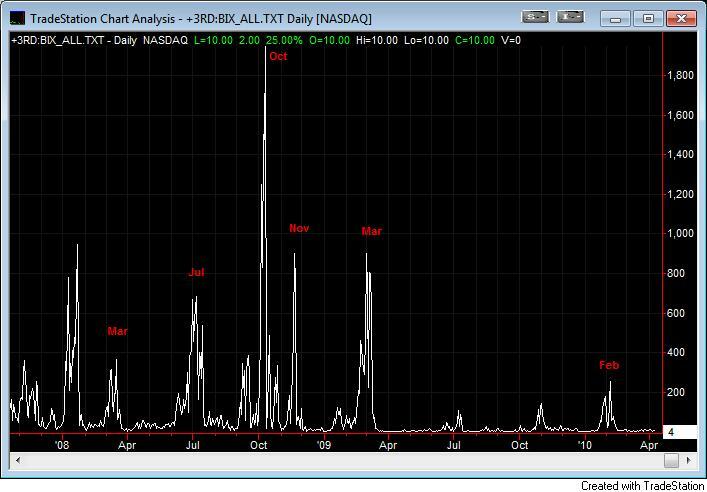 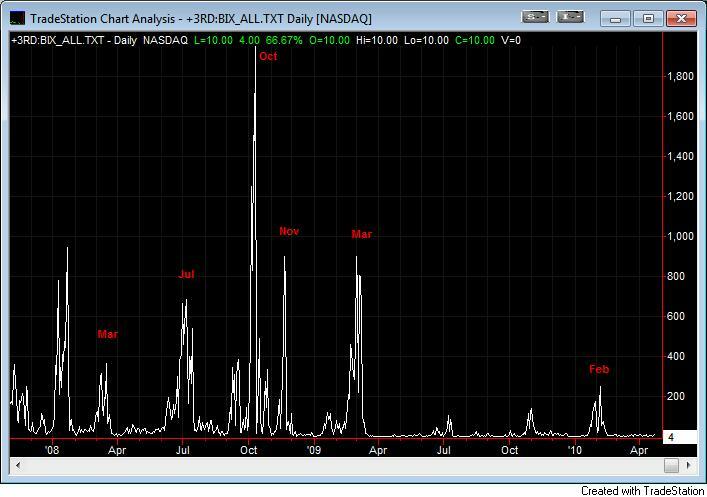 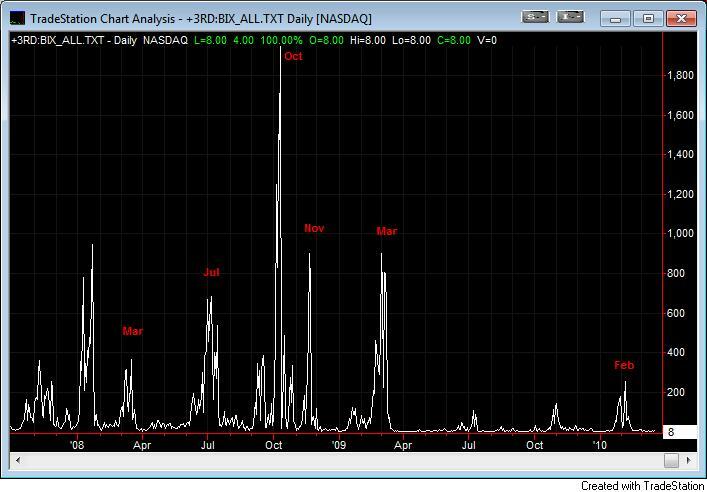 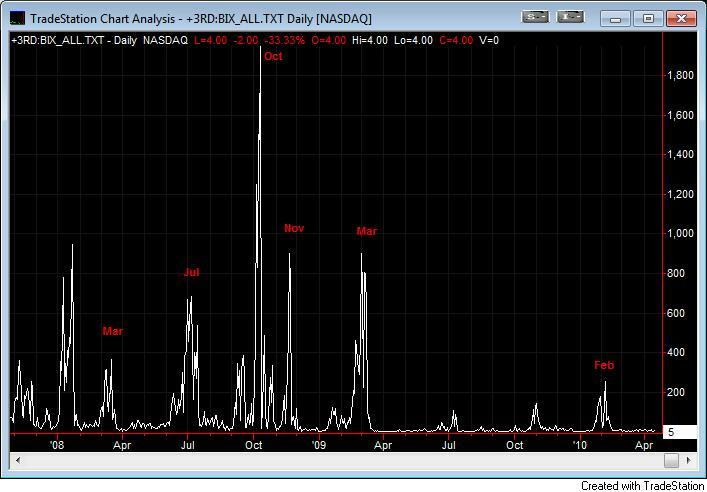 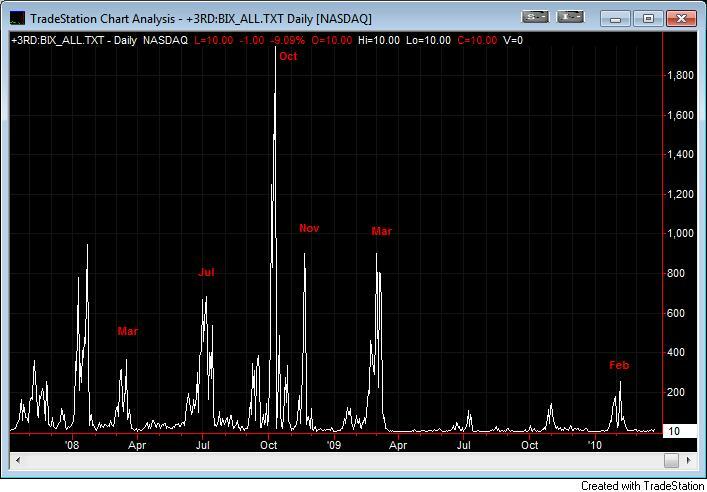 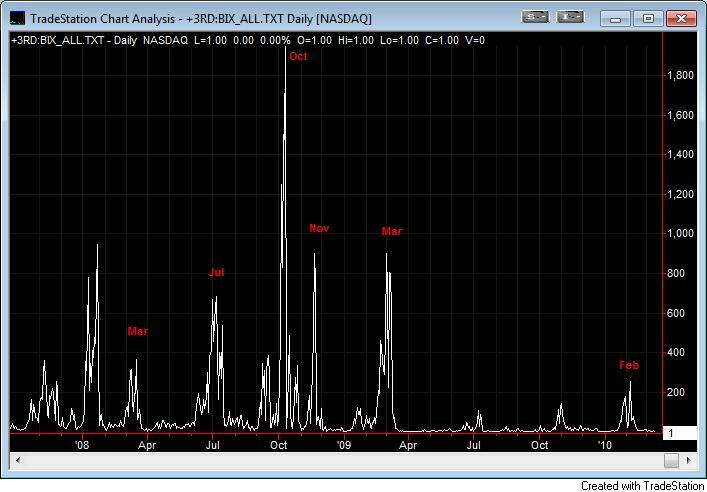 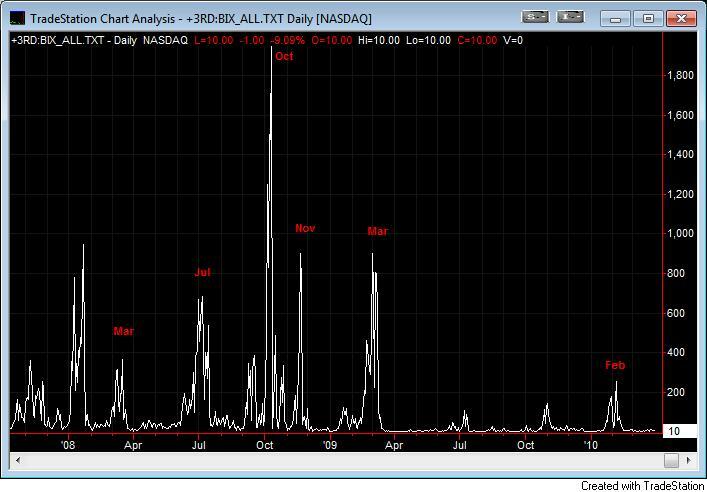 The volatility level of 5 is low and it indicates that the current market is bullish. 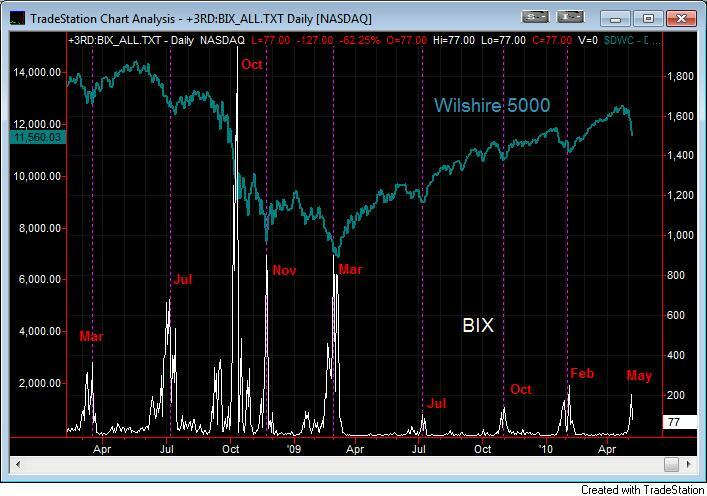 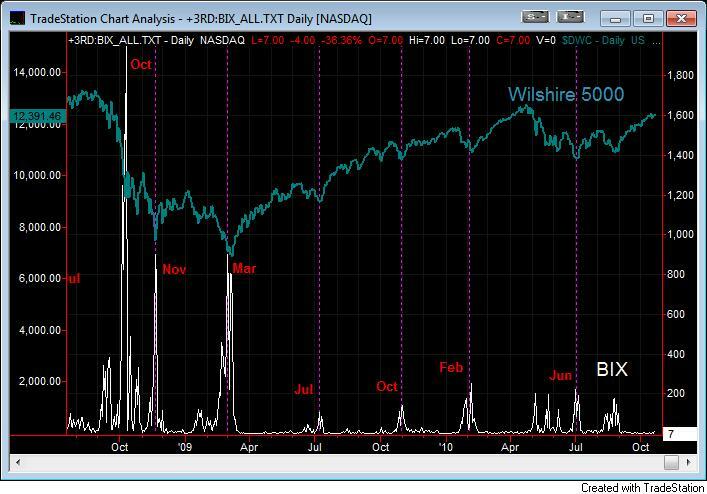 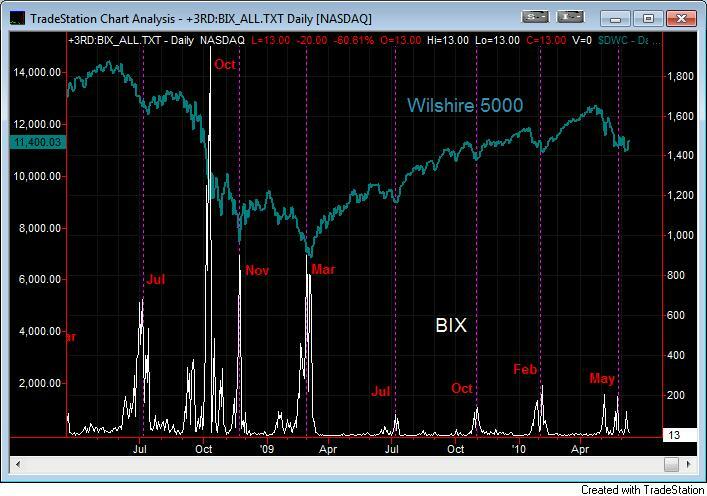 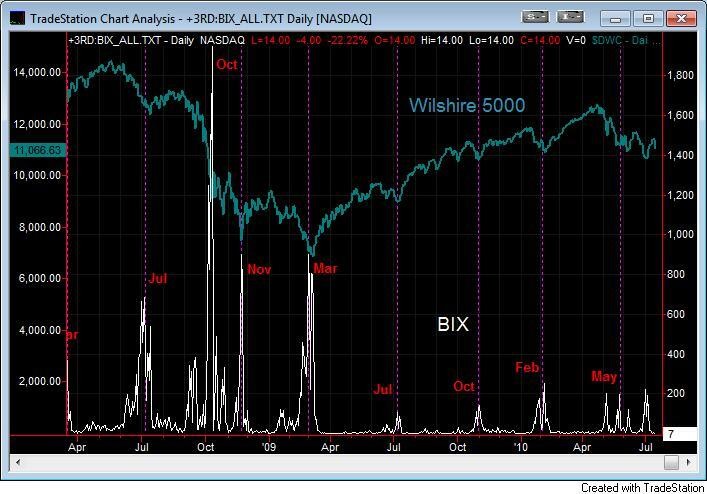 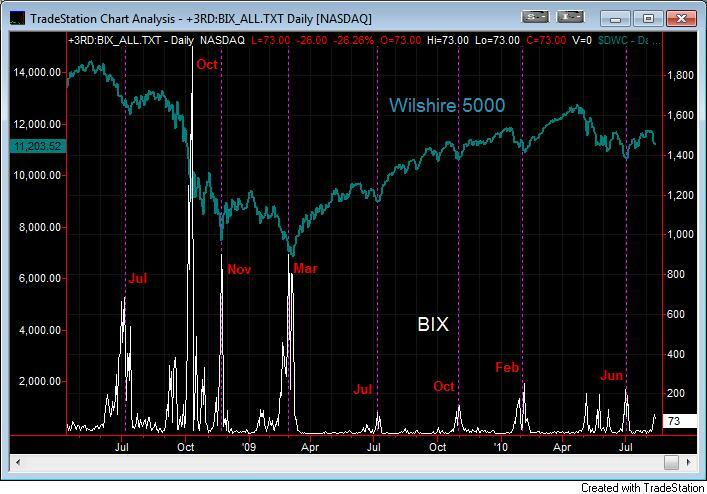 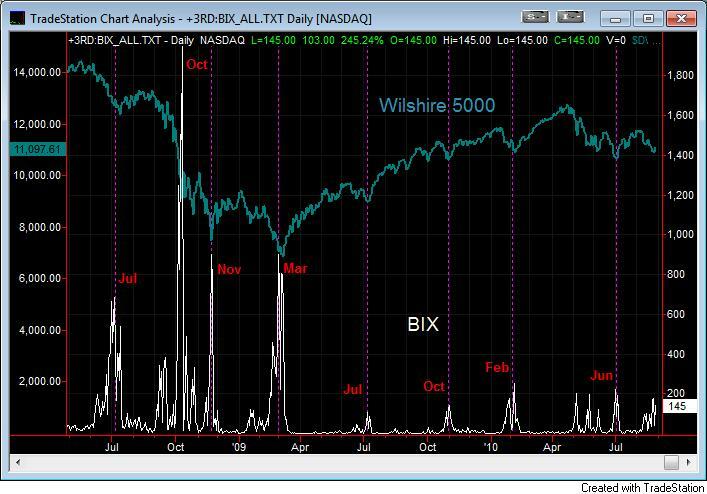 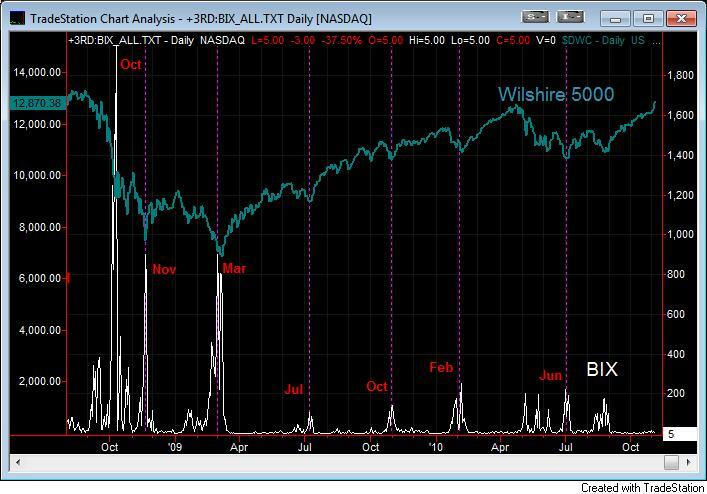 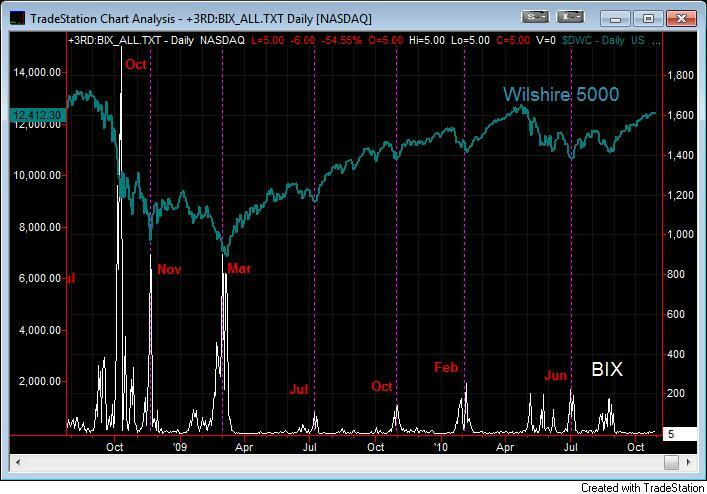 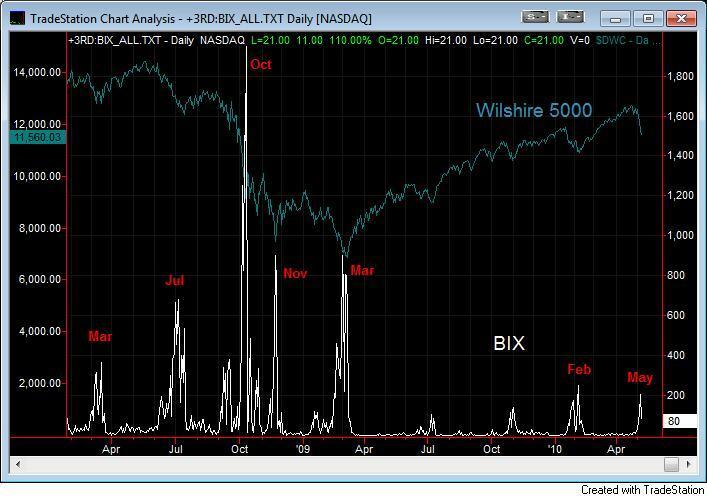 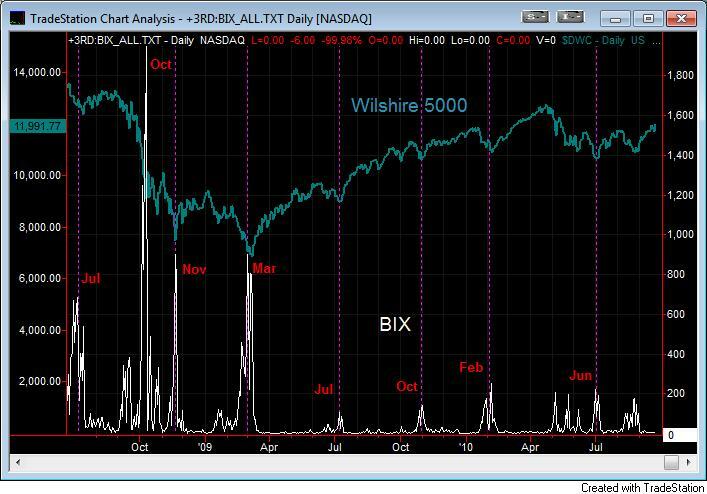 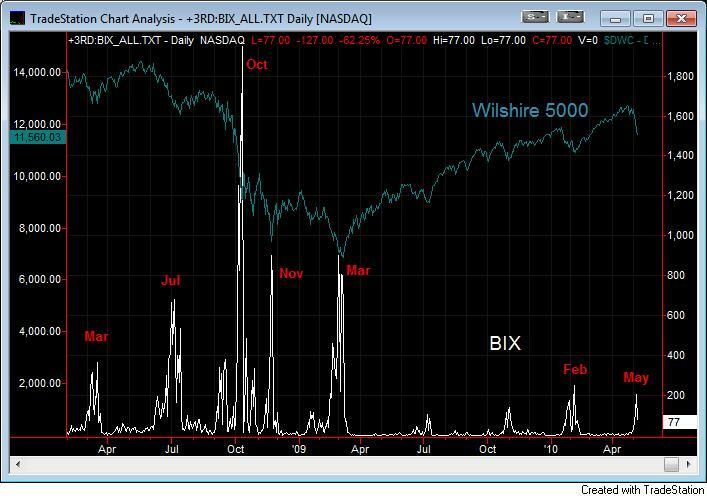 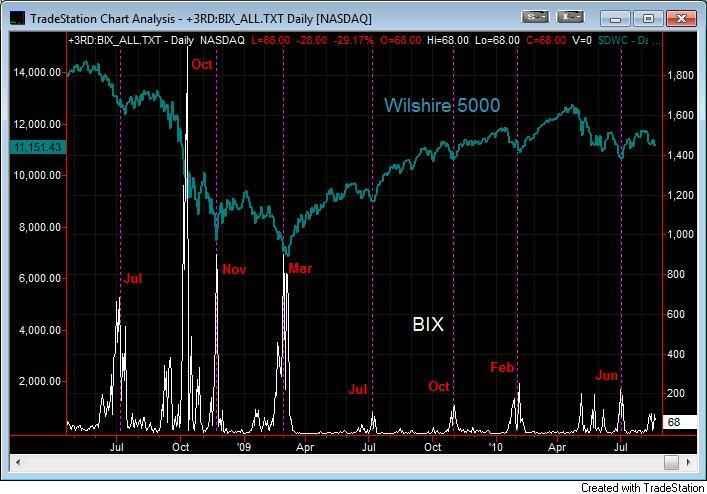 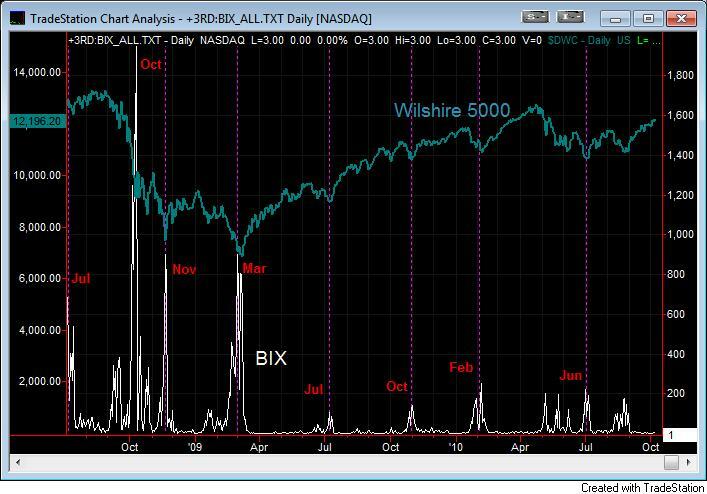 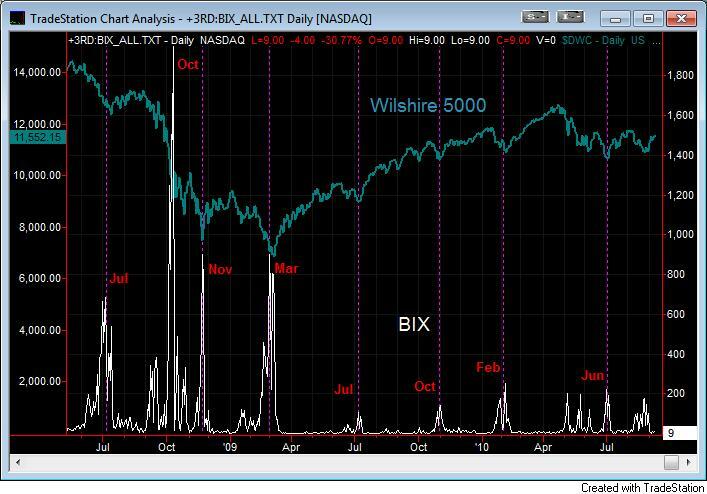 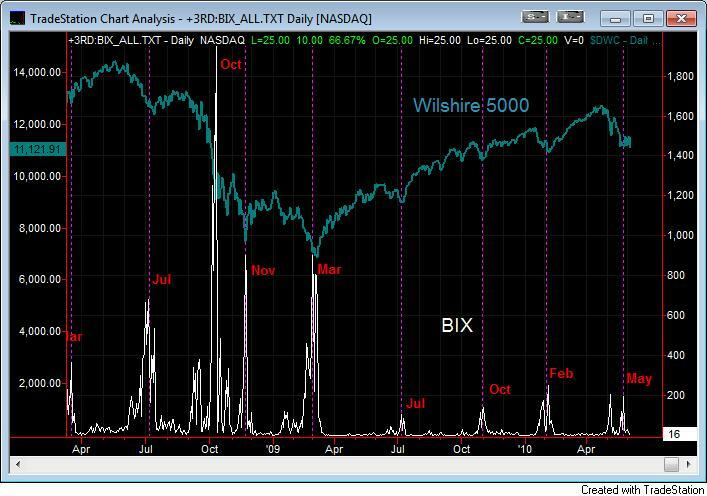 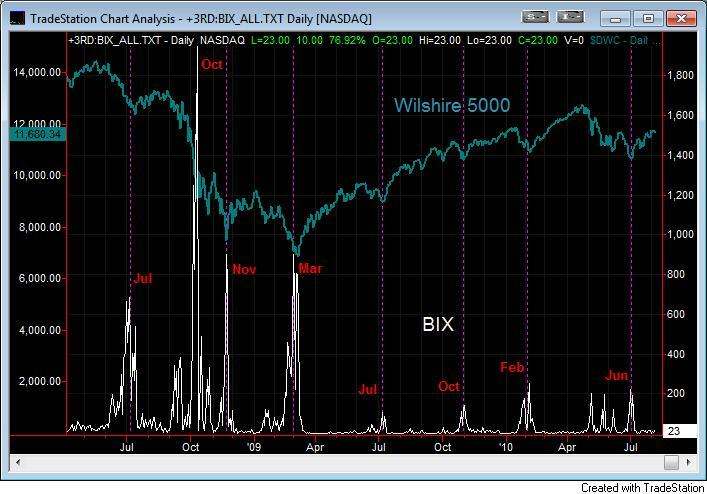 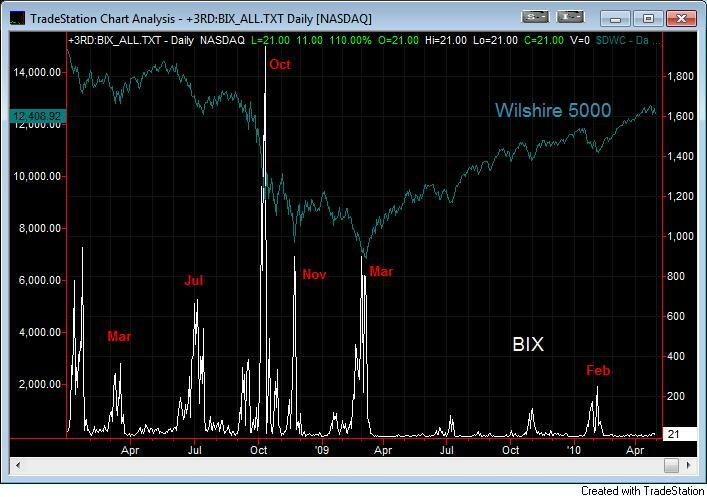 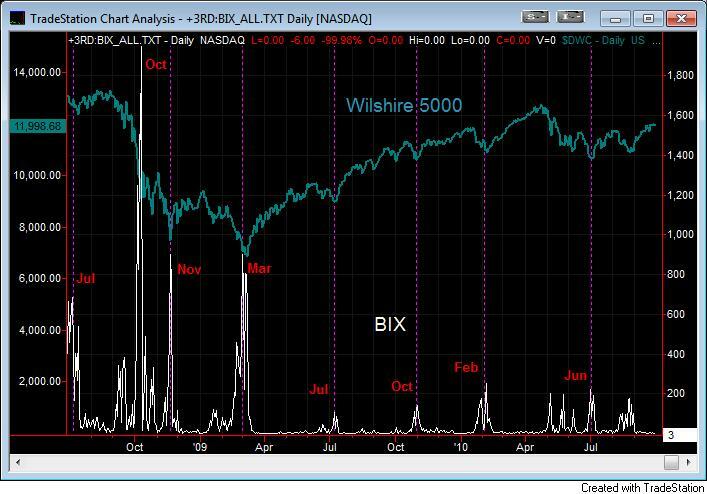 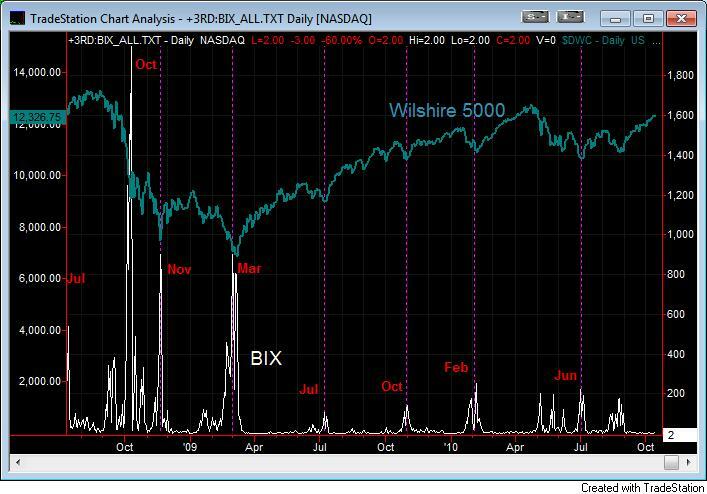 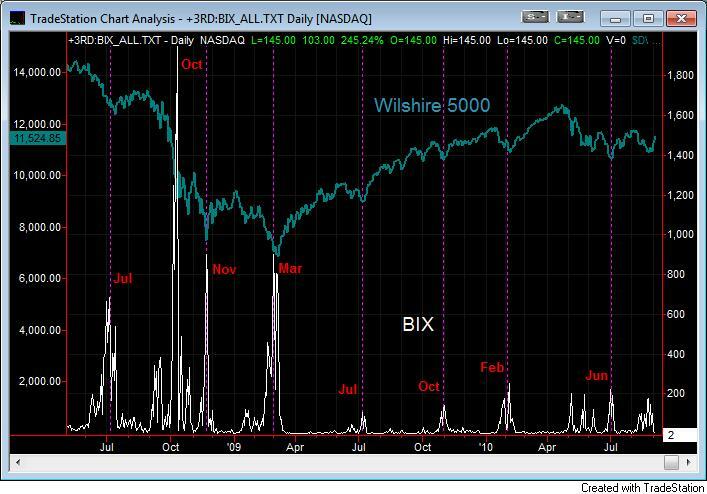 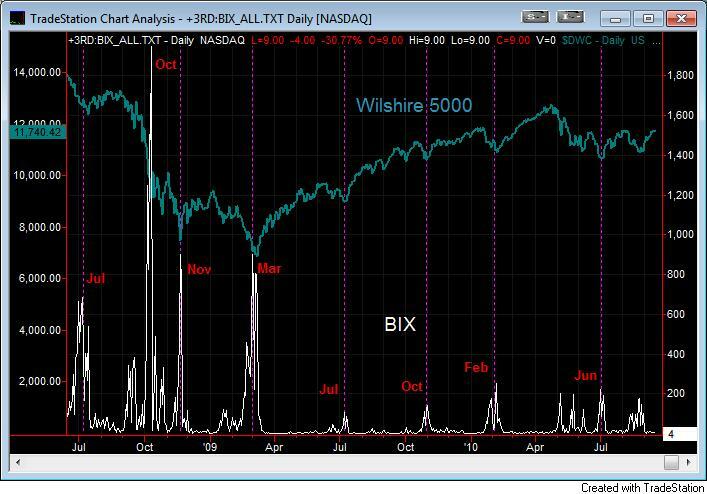 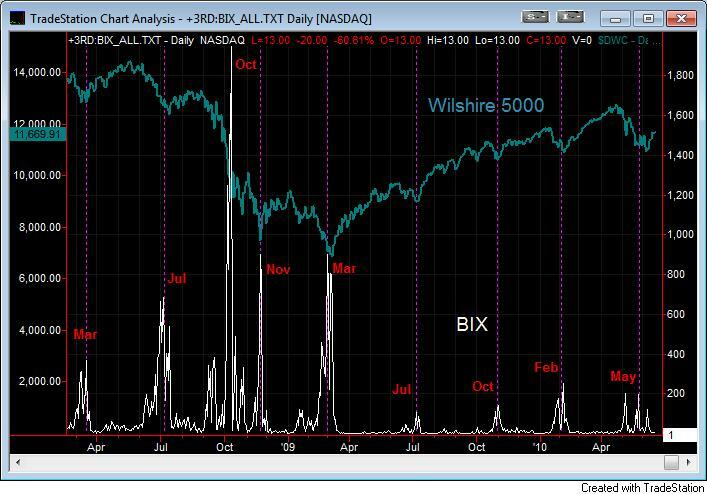 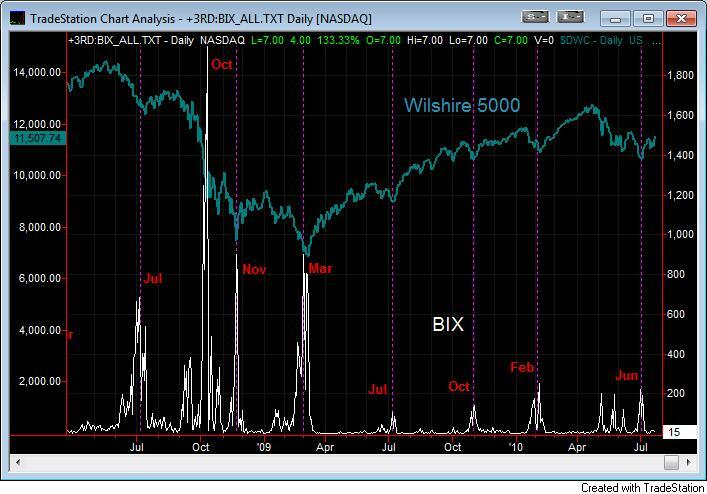 The BIX is plotted in the following chart as compared with the Wilshire 5000 index. 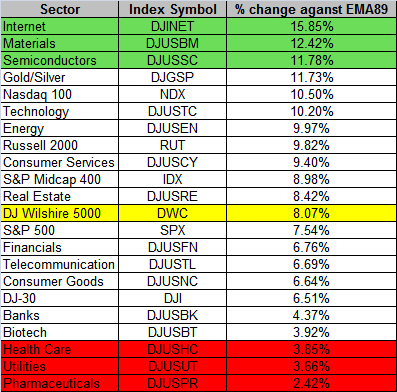 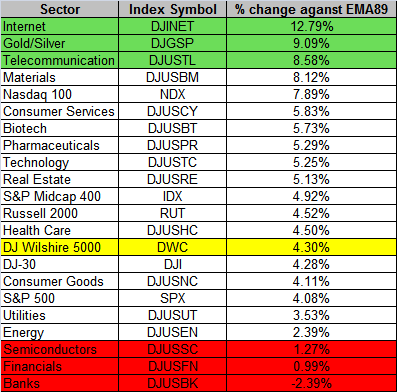 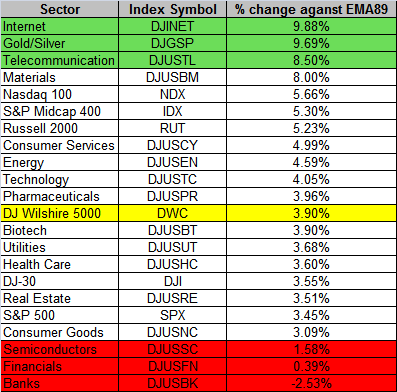 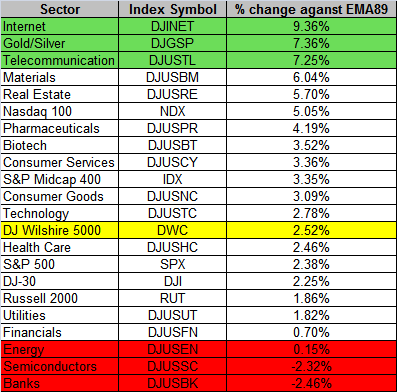 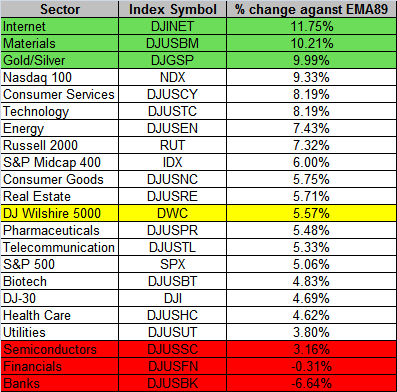 The following table is the percentage change of sectors and major market indexes against the 89-day exponential moving average (EMA89). 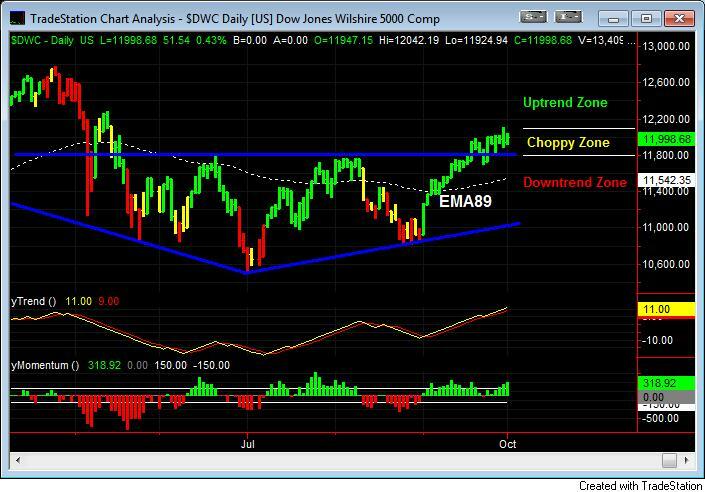 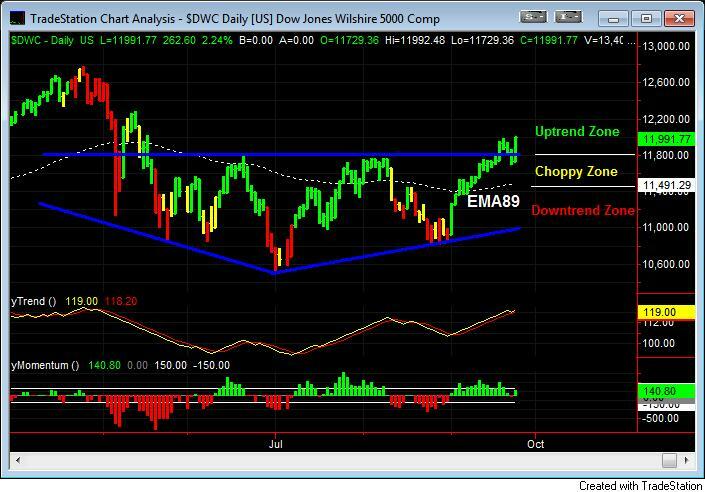 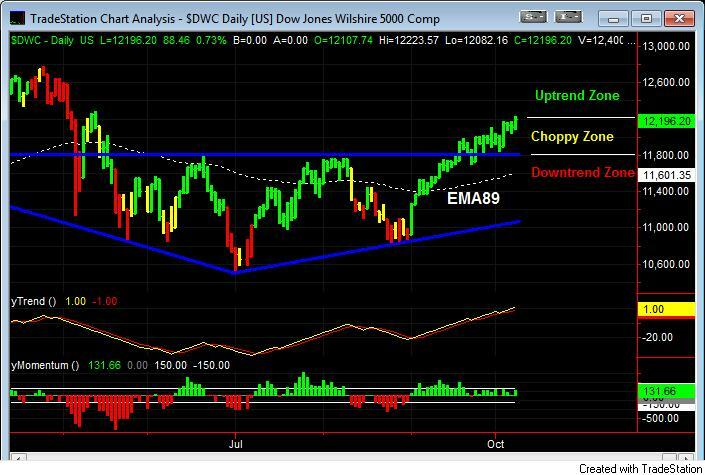 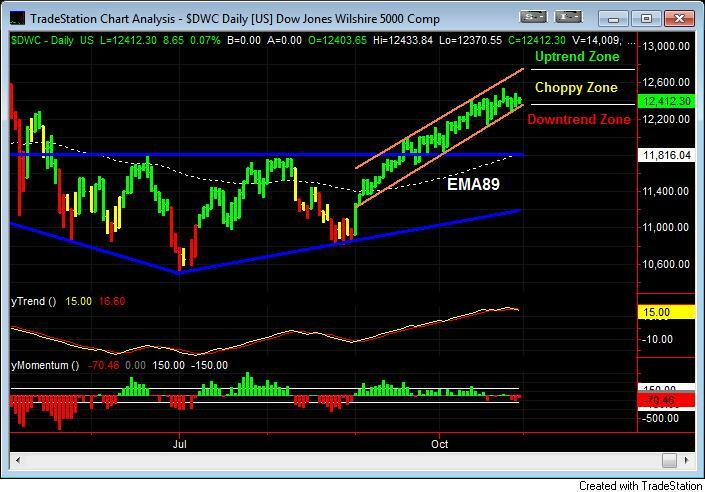 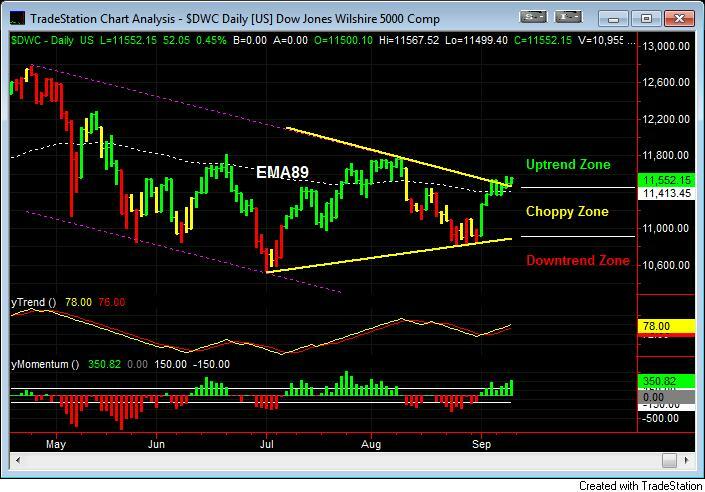 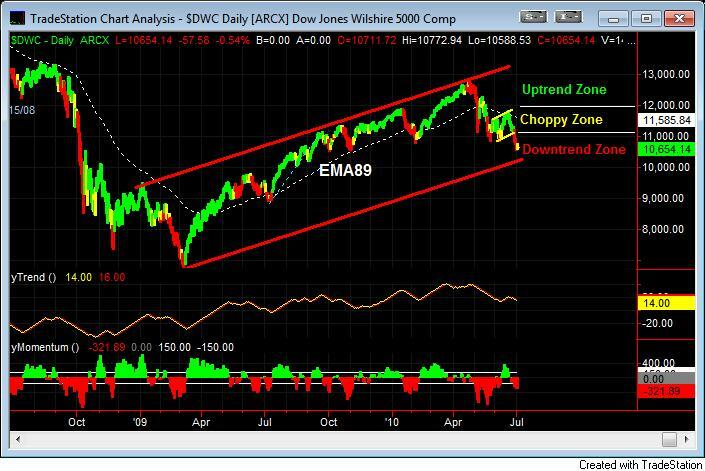 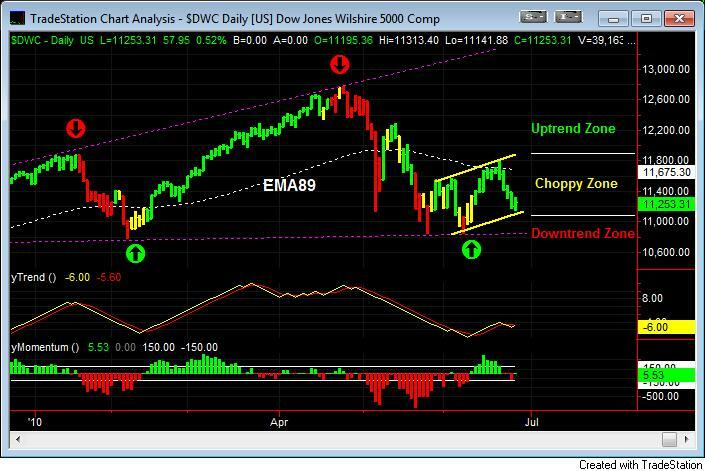 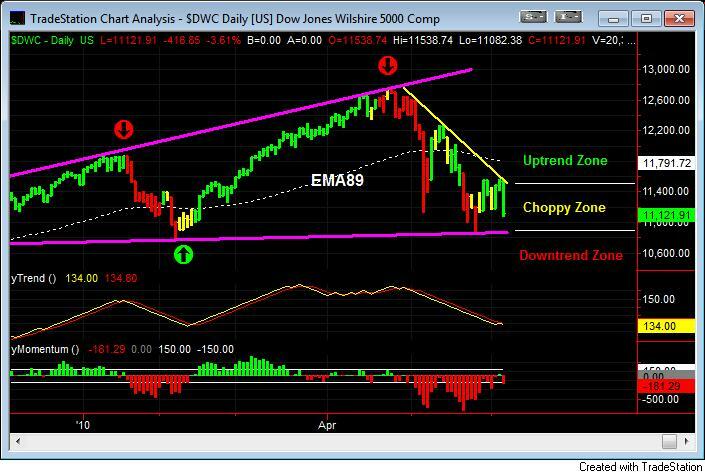 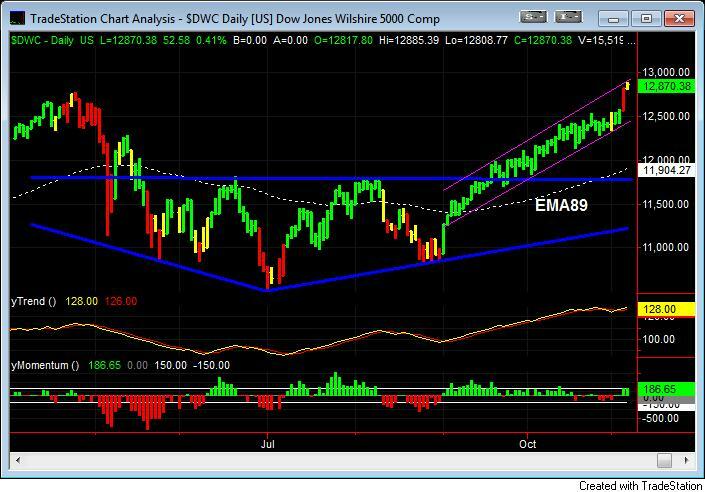 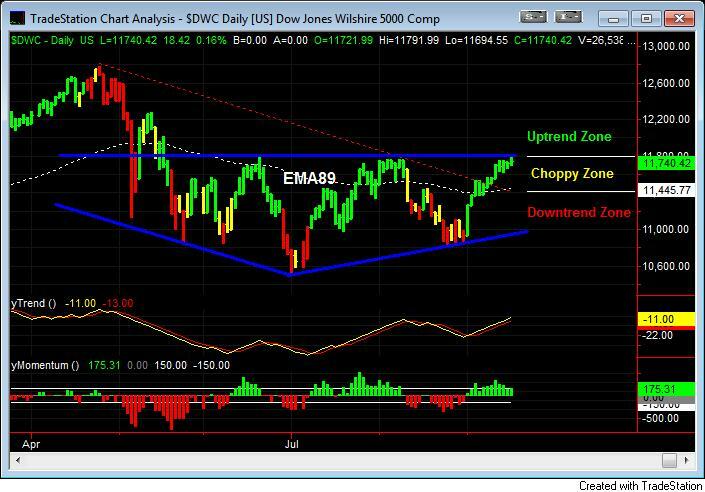 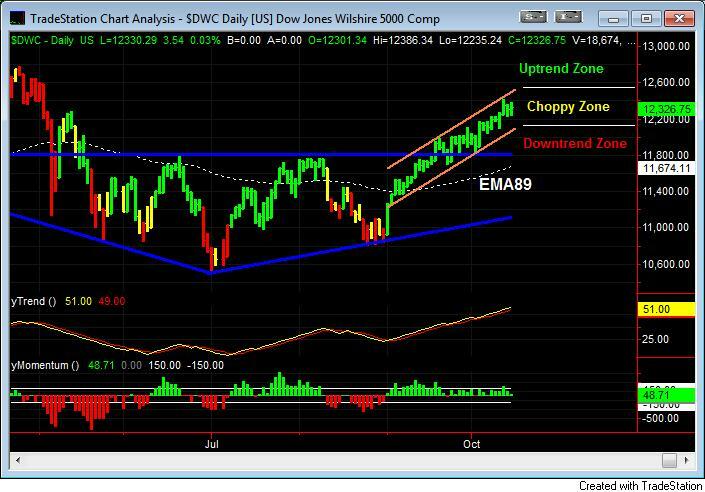 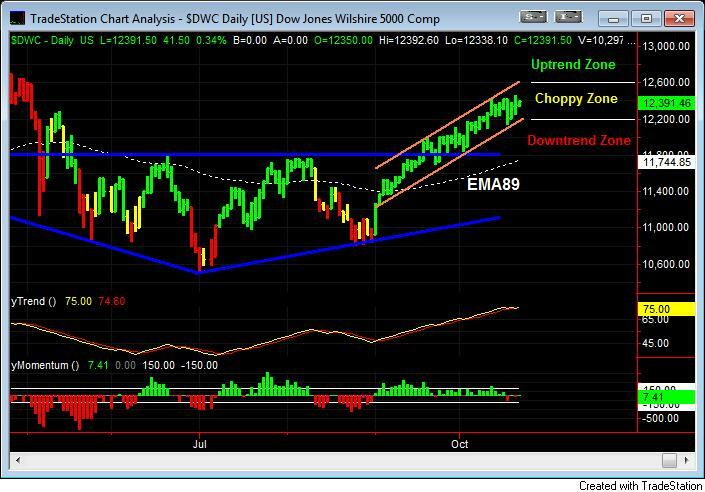 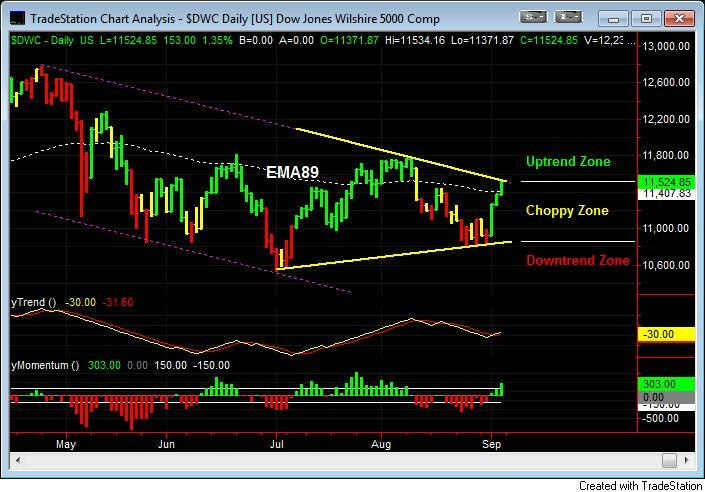 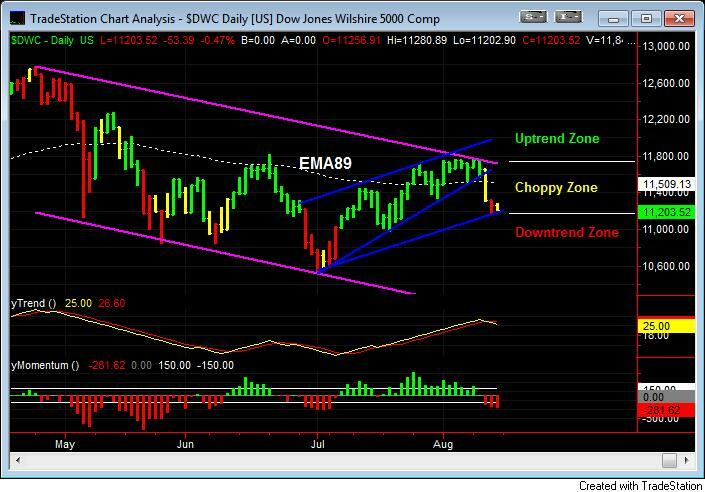 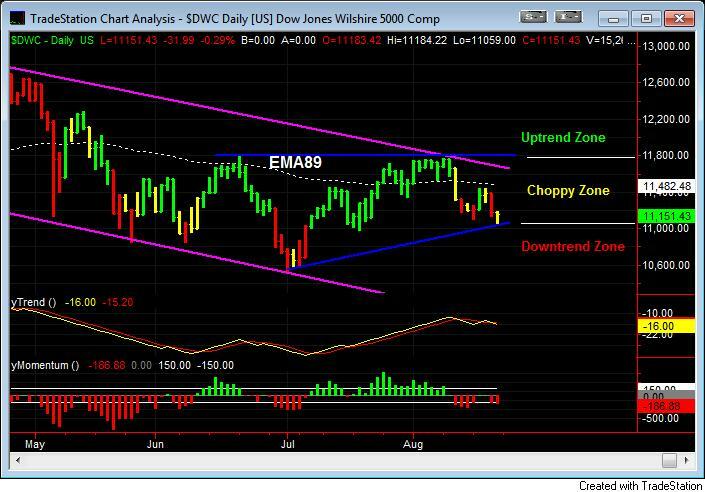 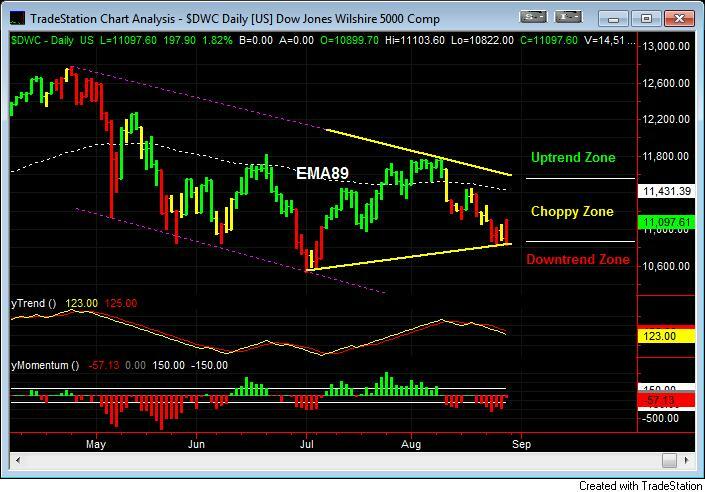 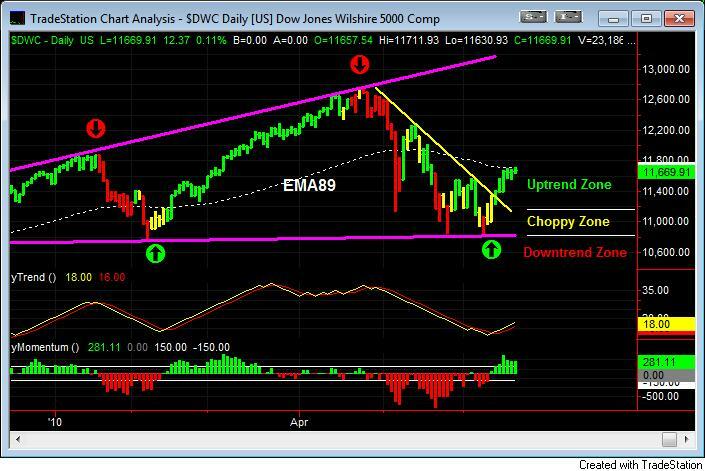 The Dow Jones Wilshire 5000, as an average or a benchmark of the total market, is 8.07% above the EMA89. 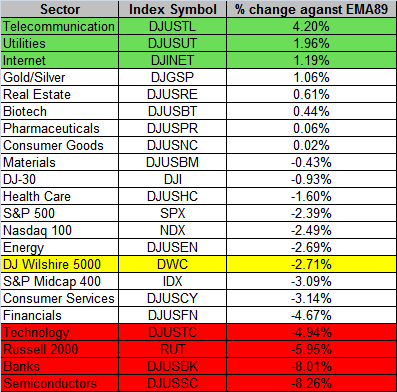 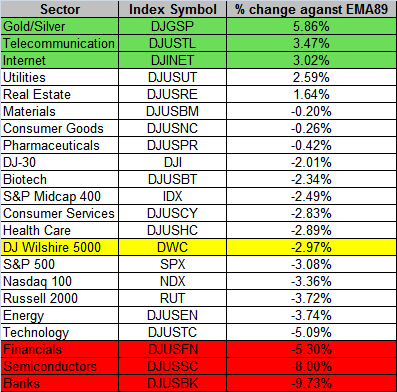 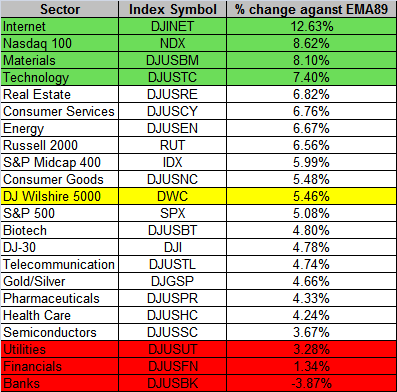 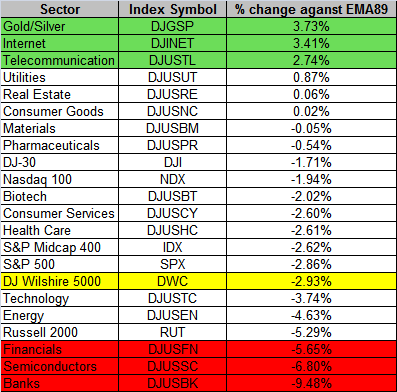 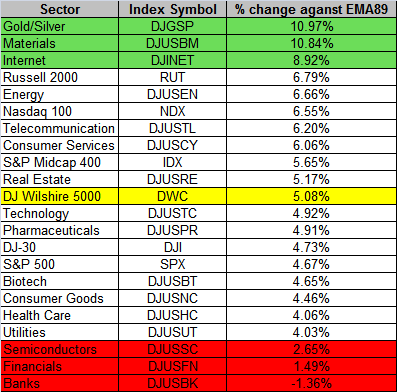 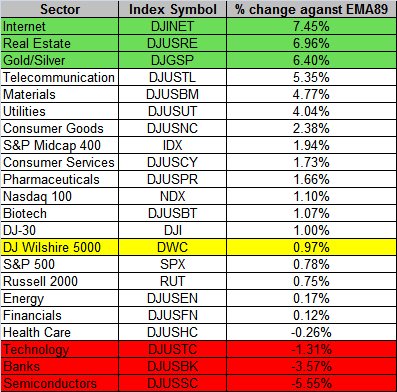 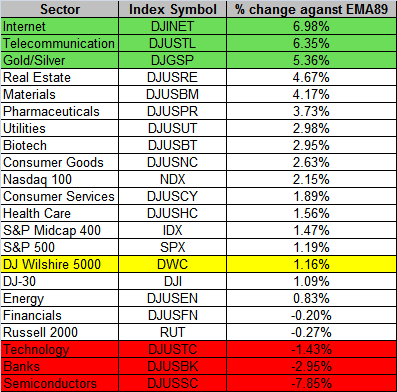 Outperforming sectors are Internet (+15.85%), Materials (+12.42%), and Semiconductor (+11.78%). 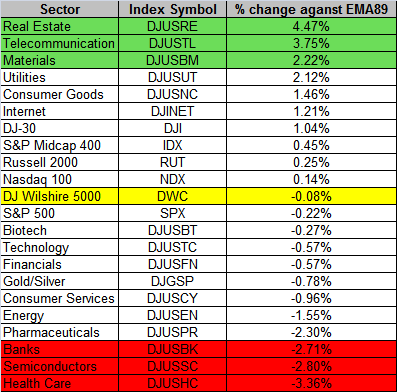 Underperforming sectors are pharmaceuticals (+2.42%), Utilities (+3.66%), and Healthcare (+3.85%). 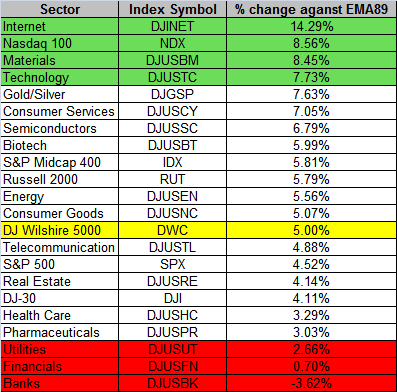 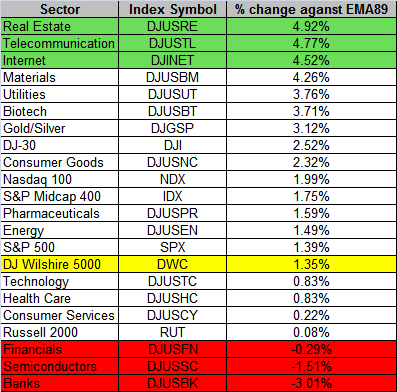 The NASDAQ 100 (+10.50%) is outperforming the market, and the DJ-30 (+6.51%) is underperforming. 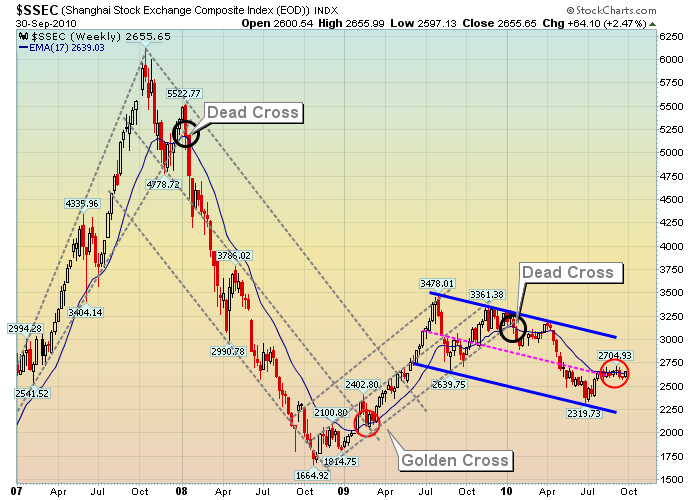 The following chart is a weekly chart of China’s Shanghai Stock Exchange Composite Index. After the bullish Golden Cross, defined by a successful breaking through both the 17-week moving average (equivalent to the 89-day moving average) and the median line of the 14-month downtrend channel around 2650, the Shanghai index had a powerful surge and tested the 14-month downtrend line. Last week the index broke through the key resistance at 3000, and kept advancing. 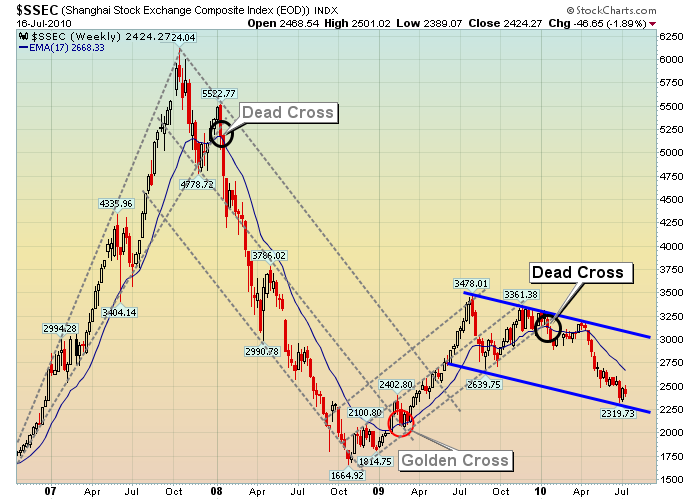 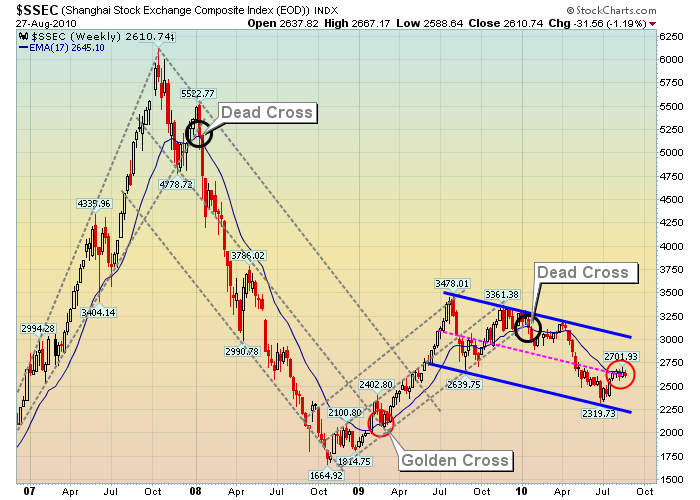 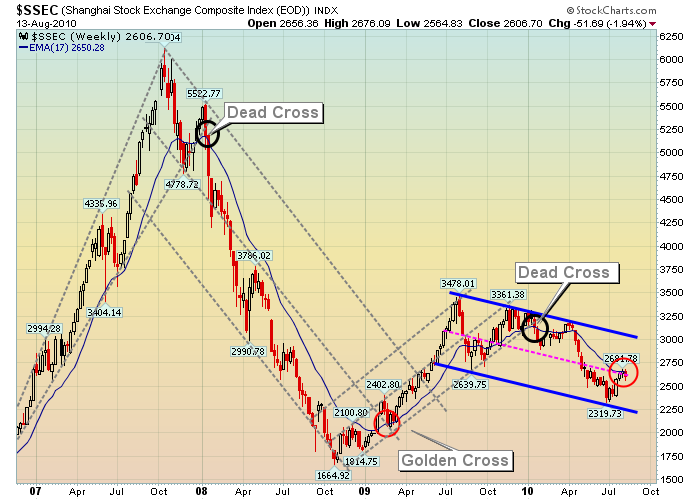 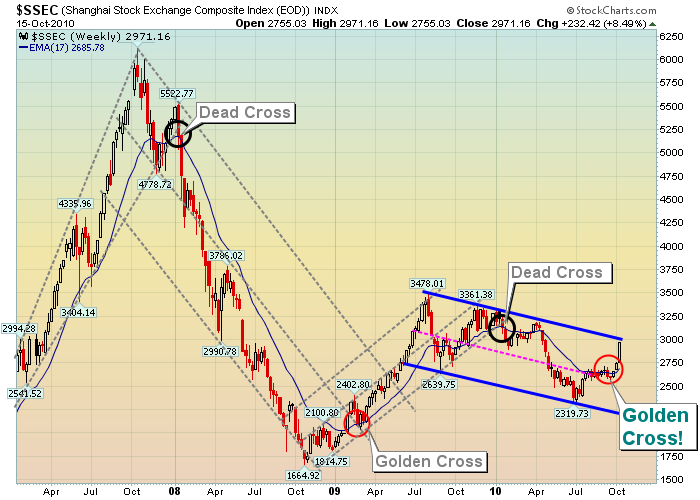 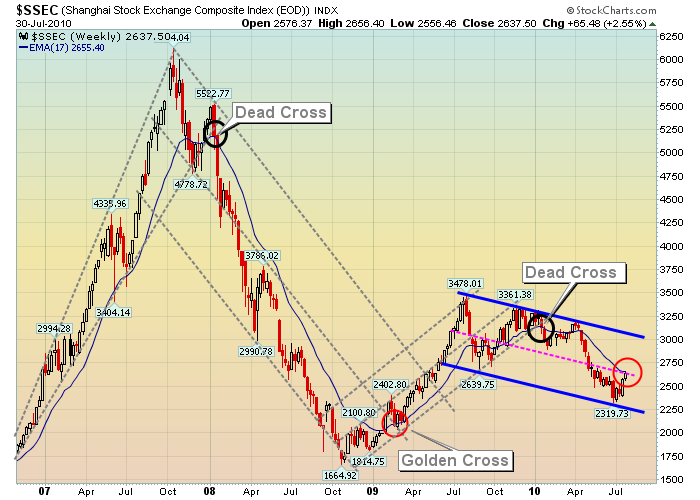 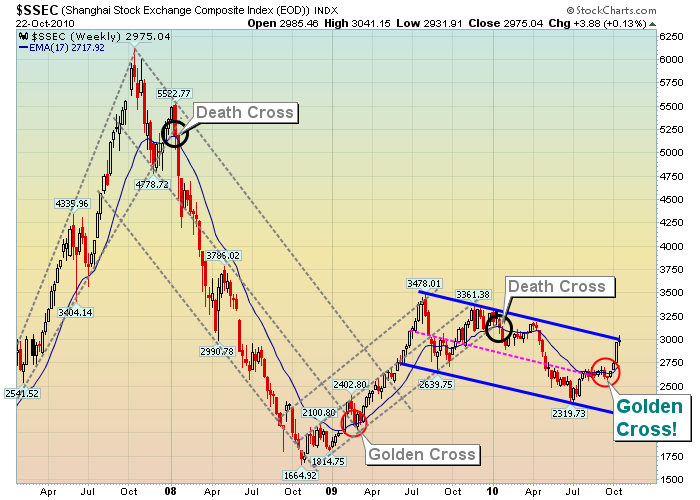 It significantly indicates that the Chinese stock market is out of the bearish shadow of the 14-month downtrend channel (the dotted blue lines), and is forming a potential uptrend channel (the orange lines). 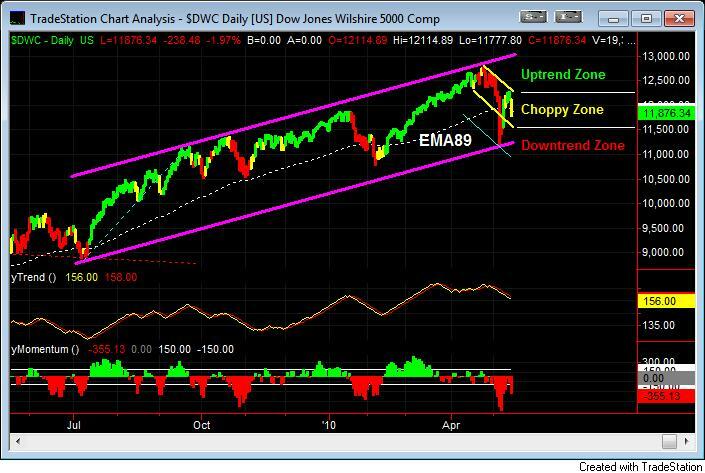 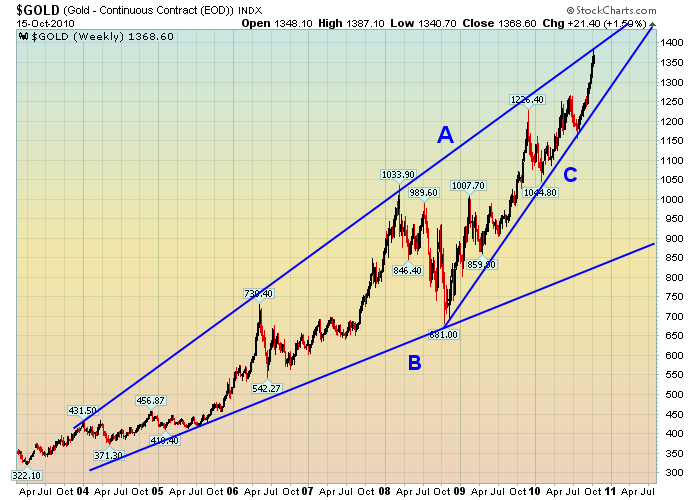 The upper boundary of the potential uptrend channel projects the price target around 4200 in the middle of 2011. 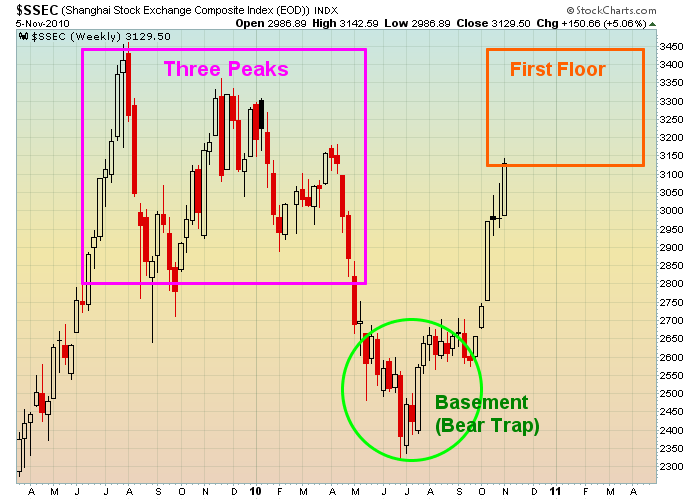 A special chart pattern, “Three Peaks and Domed House“, has been developing from China’s Shanghai Stock Exchange Composite Index. 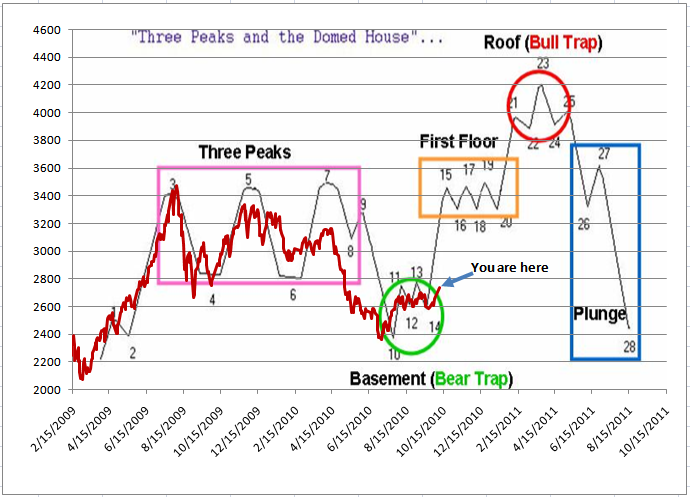 With my modified version of George Lindsay’s basic model, the “Three Peaks and Domed House” pattern can be divided into five major phases: 1) Three Peaks phase, 2) Basement phase, 3) First Floor phase, 4) Roof phase, and 5) Plunge phase. 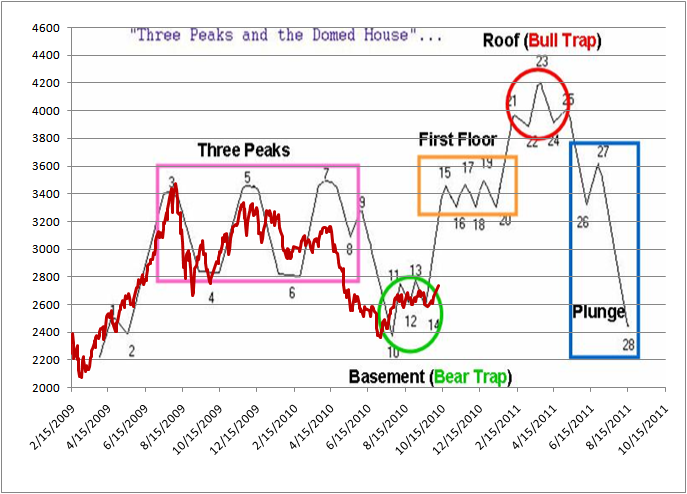 According to the projected “Three Peak and Domed House” pattern outlined in my weekly report of 10/10/2010, the Shanghai index has passed the “Basement” phase (the green circle). 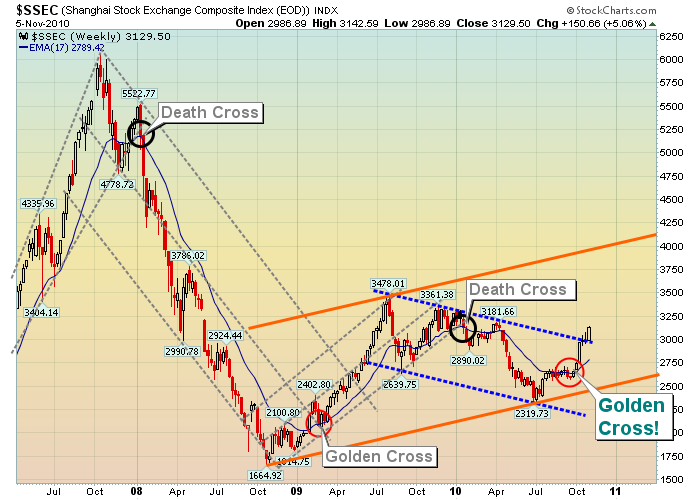 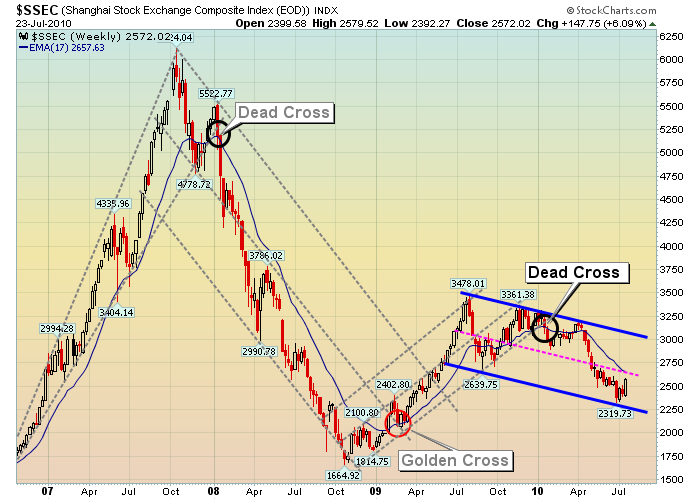 Currently it is rising towards the “First Floor” phase (the orange rectangular) with a price target around 3300.